The next day we decided to ignore the rain and head into the Mendocino National Forest as far as Lake Pilsbury where we could catch a road West into Potter Valley and eventually to 101. Along the graded dirt M1 road, we explored a couple green circle OHV trails which proved quite exciting two up, fully loaded with camping gear, and with 16 inch deep puddles where the loop-de-loops used to be. We were having a great time slipping and sliding around in the mud and were all the more excited because Dave had been running his helmet camera riding behind us the whole way. Well, unfortunately, it turned out that camera had slipped into a deep standby mode sometime after we left the casino and despite the glowing red light on the handlebar remote, had not recorded a frame. 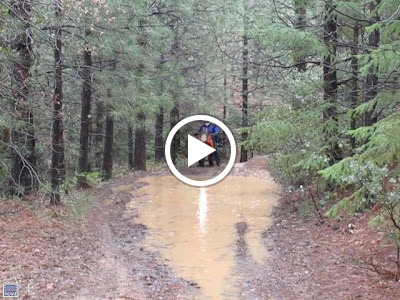 In fact, the only record we have of the rainy slosh through the forest was a video we took of him plowing through a puddle. Amped by our first successful two up singletrack trail, we emerged back onto the M1 to take stock. We quickly decided we wanted more and while I victoriously surveyed the mud caked on my brand new bike, Ann found a bush to relieve her bouncing bladder. It was only a couple minutes after she’d climbed a berm and dropped out of sight that I chose to mention through our still active Bluetooth helmet communicators that I was a little concerned at the amount of heavy panting I was hearing coming from her headset. You got to be a little careful with those things. Well, a little confidence (and a lot of water) can be a bad thing. On the next section, we almost immediately had a nice low-speed tip over. Between the elevated sides of the narrow trail and the outrigger-like side cases, the bike angle was only just barely enough to necessitate a graceful plop into the grass by my passenger who seemed to enjoy the whole thing. Now a little spooked, I proceeded as slowly as I could down the slippery trail until I figured out that at that speed, the smallest wobble made the heavy bike unstable and that a little speed was our ally. After one more Chinese fire drill, I got back on the throttle and regained our rhythm of fishtailing through puddles and bouncing over bumps with Ann laughing the whole way through the headset. Just before the trail re-met the M1, we got to the top of little up and down section with a creek at the bottom of it and feeling in our element, slowly rode down to the bottom. 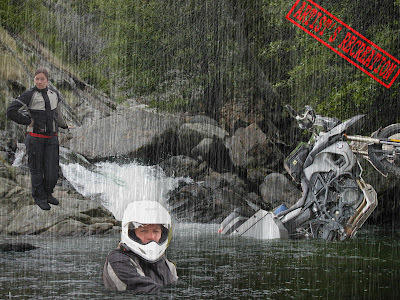 At that point, it was clear that with limited traction in the wet, the other side was going to be too steep with a passenger. Ann dismounted and I gave it a go from the bottom. Sure enough, traction was fleeting and when the rear tire started sliding to the right, the front wheel headed up an embankment on the left. No problem, I thought, grabbing a handful of brake. With the load almost totally on the back of the bike, the front brake in friction-free slop was no match for gravity and bike and all began a slow creekward creep. 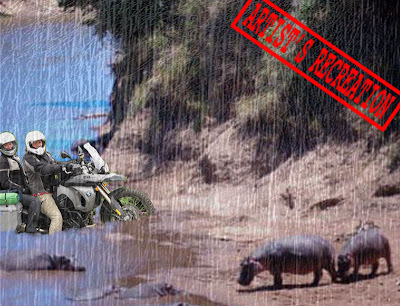 Eventually, I came off backwards landing in the 6 inch deep water while the bike slipped towards me, ending up with the rear tire in the creek and the front tire two feet up on the trail, resting on my prudently installed skid plate. Nothing bruised except ego, the three of us set about figuring out how we were going to get this 500+ pound monster up out of the creek. Attempts to ride it out just looked like a waterwheel gone haywire as the rear tire spun in the creek. Lifting was futile and moving forward or back was complicated by the side cases being wedged between the two slopes on either side. We eventually filled the creek in with enough rocks to create a ramp and were able to rev the bike up onto the trail. With all three of us pushing and me on the throttle, we muscled the slippery pig back up the slope the way we’d come. After an hour or so of wet and muddy work, we were back where we started. This time I let Dave go first on the KTM and with me briefed with strict instructions to tackle him to the uphill side of the bike should he lose momentum, he went for it. Despite plenty of wheel spin and a brief scare of a repeat performance, the orange Adventure was soon on the other side. We repeated the three person push with me on the throttle approach that had worked before with the F800 to minimize drama and without a lot of fanfare, we jointly acknowledged that this was the stuff of adventure and remounted to head up to the M1. It was still really coming down as we moved towards Lake Pilsbury, and the heat and moisture coming off our wet heads was making it all but impossible to ride with shields down. A half an hour or so more up the M1 and we came to a sign for Potter Valley pointing up a dirt offshoot. A quick confirmation on Dave’s GPS and we set off down the road. Practically puddle pro’s at this point, the five foot expanses of water stretching across the road now only inspired a burst of speed that would spray enough water to rinse of our mud caked boots. Just about the time we were really starting to enjoy seeing the next obstacle appear around each corner and, even in our soggy and exhausted state, feeling like we could handle anything, the paved road appeared. So we wound back south through the scenic farmland of the Potter Valley and amidst intercom chatter about needing a lunch stop where we could dry off a little, pushed the drowned pigs up to 80 and blasted up the onramp to 101. Though it seemed to take forever to get there, the little hippie town of Willits was a welcome sight. We scanned the options for food as we rolled through town, eventually settling on Belly Buster’s Burgers, their namesake menu item being the nineteen dollar and seventy-five cent, twelve inch high stack of everything they could fit on a grill precariously balanced between two sesame seed buns. Of course, not only was this monstrosity on the house if you could finish it but you’d get your Polaroid pinned on the bulletin board to the right of the front door as well. Disappointed by our lack of self-confidence in opting for something other than the signature dish but sympathetic to our wet and mangy state, they produced hot coffee and dry bar towels and before long, we were feeling perky again. Perky enough that is to map our location on the iPhone and call in succession every hotel, motel and no-tell from North to South between the race site and Willits and finding one with vacancy 25 miles or so South of the Humboldt Redwood State Park. Once again, we felt like we’d filled our quota for elemental exposure for the day and could rationalize another night without camping. We set a meeting location with the rest of the race crew who had driven up earlier in the day and didn’t have too much trouble convincing them to crash on the floor of our motel room. Of course, the fact that we’d left the heat at 90 during dinner in an effort to dry out our gear helped in setting a cozy ambiance.